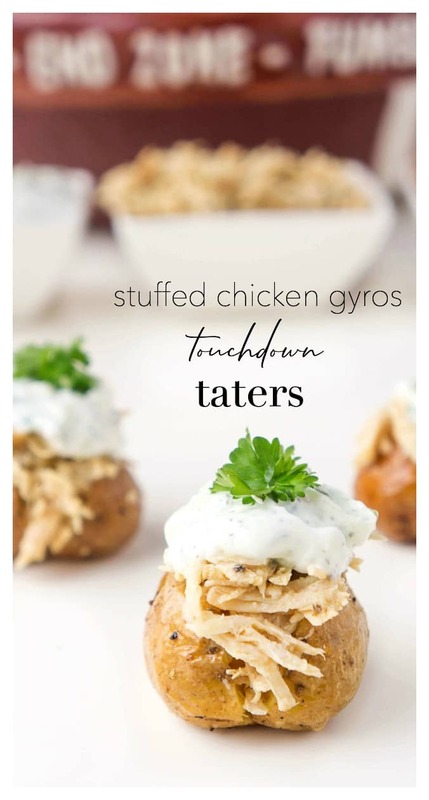 When football season rolls around, my husband is all about the football recipes. For the most part, he enjoys cooking when he’s got the time, but I always see the motivation to cook skyrocket when it’s game day. There’s something about eating good food and watching the game that puts men in their glory. So of course, I LOVE when football season rolls around because I get more help in the kitchen and it’s also an opportunity to test out some brand new recipes together! 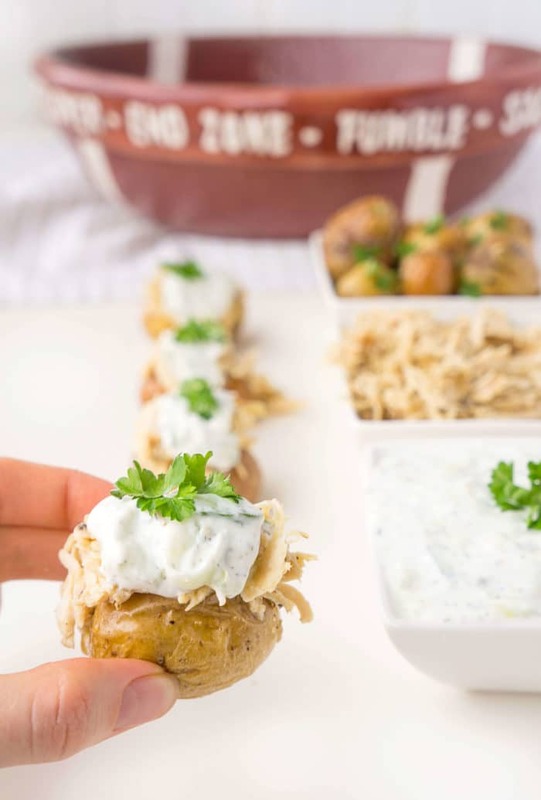 The recipe we most recently fell in love with were these Stuffed Chicken Gyros Touchdown Taters. I wish I could take the credit for it but it was actually my husband’s genius idea. It works so well because the little potatoes actually look like little footballs! These little football-like potatoes are not only adorable but they’re also oozing with flavour. We’re both big fans of Greek food so we wanted to do something with a Greek twist. To make these delicious little bites, first you want to prepare the marinade-like sauce for the chicken and allowed it to cook in the slow cooker for the day. If mouthwatering smells coming from the kitchen don’t get you in the mood for game day, I don’t know what does. While the chicken is cooking, you can prepare the tzatziki sauce. It’s actually recommended that you do prep it in advance, since it gives the flavours a chance to all come together. The longer it sits, the better it tastes! I recommend roasting the potatoes in the oven right before the chicken is ready so that it’s still warm when you assemble everything. You could of course, prepare the mixture for the potatoes in a bowl in advance and then simply place it in the oven when you’re all ready to assemble. The next part is the fun part. You simply want to slice the potatoes in half (once cooked) without cutting all the way through. Next, place some of the shredded gyros chicken in the cut area and top with a dollop of tzatziki. If you have guests over, you could either serve them pre-assembled or set up a station where they can assemble them themselves. More fun for them and less work for you! And did I mention that these are a healthier option game day option too? 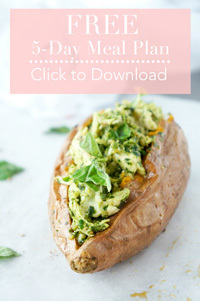 Each little potato offers a dose of protein, fibre, calcium, and potassium! 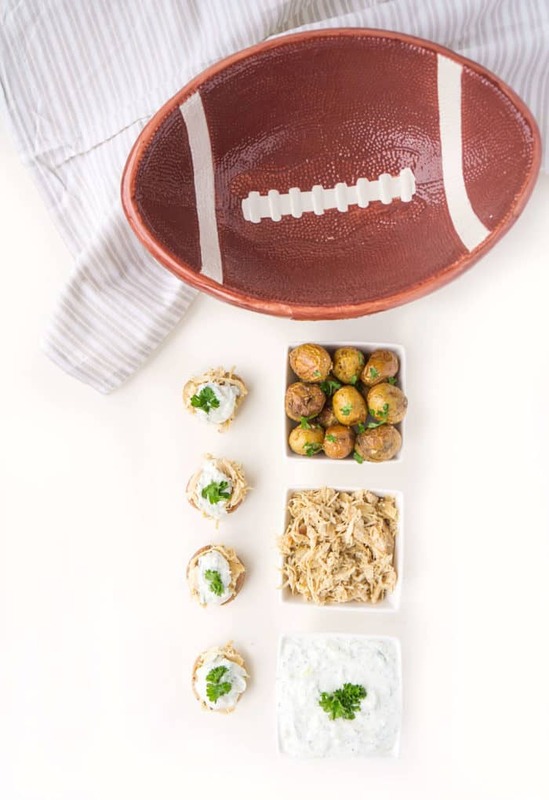 You definitely want to add this cute little appetizer to your game day menu! To make the chicken: Place the chicken breasts in a slow cooker. In a small bowl, combine the onion, garlic, oregano, salt, pepper, olive oil, red wine vinegar, lemon juice, and water. Pour over chicken. Cook on low for 6-8 hours or high for 4-6 hours. Once the chicken is cooked, shred using two forks. To make the tzatziki: In a medium bowl, combine Greek yogurt, cucumber, garlic, dill, and oregano and lemon juice. Season with salt and pepper, to taste. Refrigerate for 30 minutes to allow the flavours to blend. To make the potatoes: preheat the oven to 375 degrees F. Place the mini potatoes, olive oil, minced garlic, salt and pepper in a large bowl and toss to combine. Distribute the potatoes evenly on a baking sheet. Roast in oven for 45 minutes to an hour, or until soft when pierced with a fork. To assemble the stuffed mini potatoes: Cut each mini potato down the centre, approximately ¾ of the way down, without slicing all the way through. 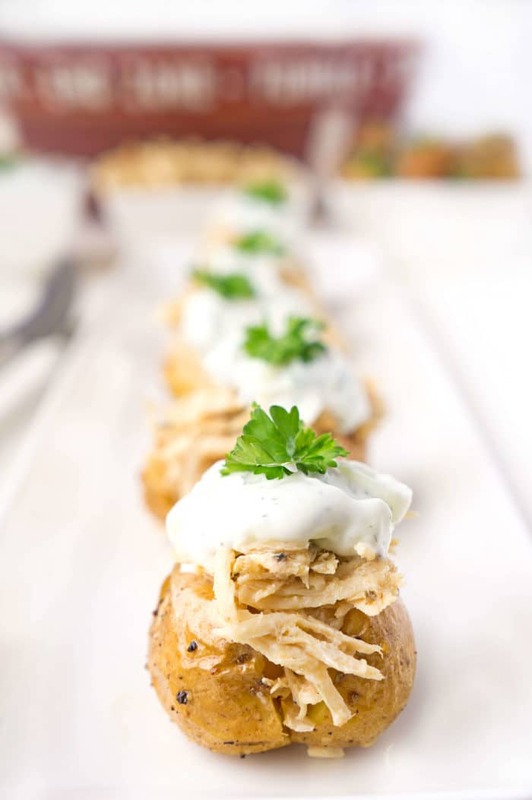 Evenly distribute the shredded chicken among the potatoes, inserting it into the area that was cut. 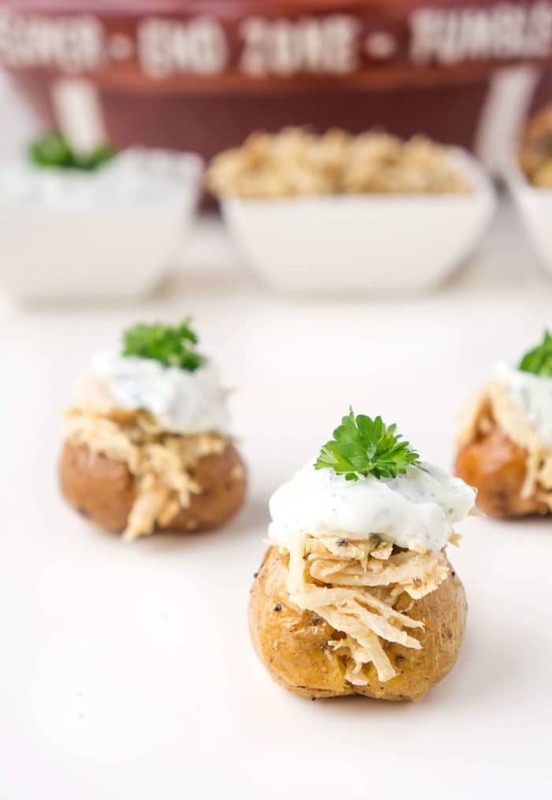 Top each stuffed potato with a dollop of tzatziki and garnish with a sprig of fresh dill or parsley, if desired. 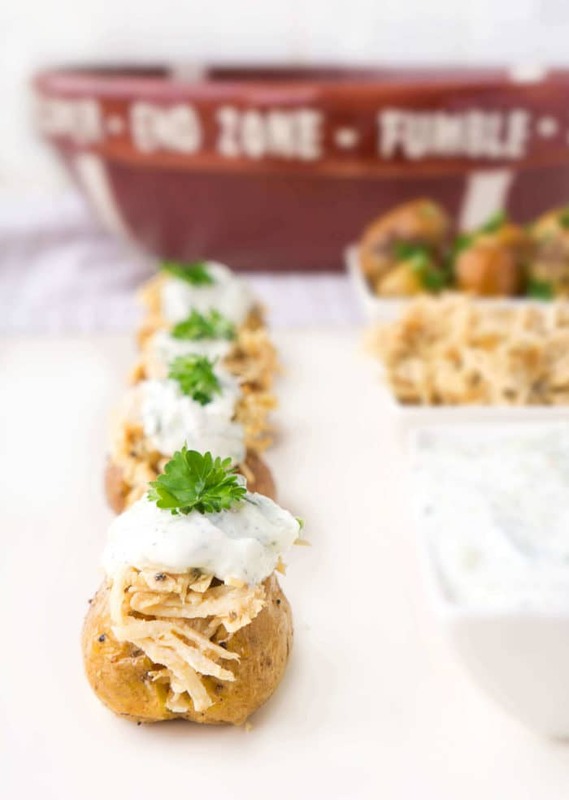 Looking for other game day recipes? Check these out!